News release about the workshop that brought together over 60 experts on “Life cycle Assessment (LCA) and Risk Analysis in Nanomaterials-related NMP projects” (Brussels, March 2, 2011) have been published in the Material Blog of the European Commission. Please click on the following link to go to the EC Material Blog. The M-RECT project aims to create multiscale-reinforced semi-crystalline thermoplastics (PEEK and PPS), which will outperform all reinforced polymers in terms of strength, stiffness, creep and mainly damping by upscaling and further developing state of the art production methods, within cost-efficient manufacturing routes. The envisaged multiscale reinforcement will comprise of dispersed straightened and aligned to polymer molecules multi-walled carbon nanotubes (CNTs) and also fully impregnated, long carbon fibres (CF). The objectives aim to develop physical (i.e. microwave heating, rollingstretching-annealing) and chemical (i.e. 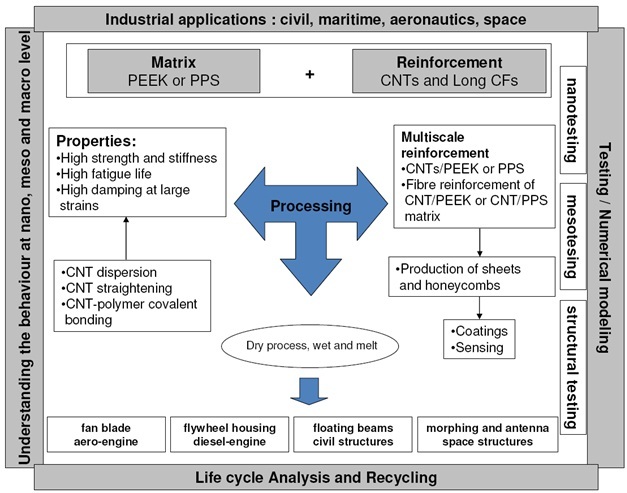 PEEK-specific CNT functionalisation) processing methods leading to the development of a production line for a tailored PEEK-CNT engineering nanocomposite, which will be readily upscalable to industrial level (i.e. buildings, aeronautics, automotive, space). The project seeks, primarily, to develop a generic technology for production, modelling and design of high-performance, light-weight reinforced thermoplastics. The envisaged multiscale reinforcement will comprise of disentangled, dispersed, straightened and aligned multi-walled carbon nanotubes (CNTs) and also fully impregnated long carbon fibres (CFs). Honeycomb cores - panels (multiscale reinforcement). Laminated complex-shape parts (multiscale reinforcement). The main competence of the center is in the area of assessment, analysis and management of business and technical risks. The center has large experience in co-ordination of European and national stakeholders, promotion of the transfer of technology, introduction of new approach to the risk management. Participation in many EU and international collaborative and purely industrial projects, in both as participant and as coordinator/project manager. The main task of R-Tech in M-RECT project is related to a sensitivity and risk analysis within work package 4. R-Tech will develop web based tools for the assessment of the risks of non-performance failure specifically in work package 4 but which can be applied to the whole project. In addition they will carry out a sensitivity analysis to determine what, if any, perturbations may influence the success of the work package and the project as a whole.